Which is the Right Top Rated Portable Generator for You? A portable generator is one of the most versatile, worthwhile tool purchases you’ll make in your lifetime. A portable generator helps you make those big DIY dreams a reality, and it keeps you prepared for the worst if your house loses power. However, there are an awful lot of models out there, all with different features, fuels, and power outputs. Sorting through them all to find the quality ones can be arduous. Plus, you have to make sure that the specific model you buy is actually appropriate for your power needs. We started this site to help you sort out all your portable power needs! Here on our homepage, we’ll take you through all the different types on the market today, with a special focus on portable models. Our comprehensive guide will help you get a sense of all your options, and help you figure out which unit is the best choice for you! We’ve come up with 3 top models to recommend in the portable department. We’ve written our own in-depth reviews for each one, which will show you all the key features we’re loving on these. We’ll also break down all the reasons we think they’re better than the competition! *For this guide, we’ve looked at larger portable models that can handle powering basic house functions in an outage. If you’re looking for something smaller, take a look at our special guide to the best small portable generators here. Our top budget slot goes to this Champion model. It’s a fully-powered, fully-equipped generator that gets pretty much any job done on a budget! We like the Champion because while it might not be as sophisticated or as quiet as its more expensive competition, it puts out just as much power when you need it! This is a 7500W model that can keep your lights on and furnace running in an outage, or give you all the power you need at a work site. If you need to find an inexpensive portable unit that won’t let you down, this is the machine for you! It’s relatively inexpensive. This machine is 1/5 the price of our most expensive recommendation, even though it puts out just as much juice. We think the Champion is the least you can safely spend for a 7500W model. For a start, it’s much better-made than other budget options. It’s powered by a reliable, rugged motor which is both low-maintenance and powerful. The frame is all steel, and the wheels have special tires which can’t get punctured or flattened. Previous buyers were overwhelmingly impressed with the Champion, especially compared to other inexpensive Chinese-made models they’d used previously. We think this model is the best build quality in the budget range by a long shot! It runs on both gasoline and propane. We like dual-fuel models because they allow you to use whichever source is most readily or cheaply available to you. Plus, you can switch over to propane if you run out of gas, or vice versa. This one will run up to 8 hours on a full tank of gas, and 5.5 hours on a standard 20 lb tank of propane, like you’d use for your grill. It has an electric start function. That means you can start this one with the push of a button. No yanking on a cord or fiddling with the throttle in a snowstorm! This one starts easily with one touch, and it automatically recharges the starter battery while it runs. This one also has a cold-start system onboard, and previous buyers said they didn’t have any trouble getting it running in snowstorms. This one also has an electronic display panel and monitoring system, which you don’t ordinarily find on machines in this price category. It gives you readouts on power production, and tracks running hours so you know when you need to do maintenance on it. It has two locking outlets, one at120V and one that can work on either 240V or 120V. You also get 4 normal household outlets which run at 120V. It’s a powerful machine. The Champion produces 7500W on gasoline, and 6750W on propane. That’s plenty of power to cover your sump pump, water, furnace, and other essentials like a fridge. You’ll also have lots left over for watching TV, running fans, and other smaller loads. On a worksite, that means plenty of power for running all your tools, whether they run at 240V or 120V. There’s also a standard 30A worksite outlet that’s perfect for construction or intense DIY projects. It’s CARB-rated for emissions protections. That means this one’s eligible for sale in California, which has the strictest emissions standards in the States. All the outlets are GFCI protected, to make sure power spikes or blips can’t damage your appliances or electronics. That’s a big advantage over the cheaper options, many of which produce uneven, unprotected power which can fry things like TVs or smartphones. This one has a total harmonic distortion rating under 5%. It has a solid wheeled base and a foldable handle for carting it around. While this isn’t the lightest or smallest model in its power range, it’s still very manageable. It’s covered by a two-year warranty and lifetime tech support. Previous buyers wrote in their reviews that they didn’t have any need to use their warranty, since the Champion ran so reliably! It’s not as efficient as the more expensive options. The Champion does use a fair amount of fuel, so you’ll have to refill the tank more than you would with a more expensive Honda or Yamaha. It’s loud. This one is about 75 decibels at 23 feet, so it’s not something you’d want to park very close to the house. It’s heavy. This one weighs over 200 pounds, so you won’t be lifting it in a hurry. Thankfully, it’s on a wheeled base. Just be sure you don’t need to get it up steps or over obstacles without help. Champion don’t have the best reputation for reliability. We haven’t seen any major issues reported for this model, but we have noted that other Champion models have a mixed track record. This probably won’t have as long a working life as more expensive models, and it may need some repairs along the way. 5% THD (total harmonic distortion) is very impressive for a machine in this price range, but we’d make sure you have surge protectors on your expensive electronics, just in case. We really prefer something closer to 1% for things like A/V equipment or mobile devices. For most appliances and tools, though, you should be absolutely fine. CAT’s RP12000E is our “bang for your buck” recommendation! While it’s not the most expensive machine here, it cranks out the largest wattage. This honker can easily power a whole house through an outage. In fact, most households could completely ignore grid failures if they had one of these hooked up. We recommend this one to anyone who wants maximum power in a portable package. The CAT is seriously powerful. Not only does it knock our other portable picks out of the water, but it actually has a higher max output than many stationary backup generators! The CAT can comfortably sit at 11,000W, and cranks out up to 12,000W at a pinch. Most importantly, it comes out of the gate with an even bigger grunt. The CAT has a 15,000 starting wattage, so it can take big appliances online with no issues at all! You can run furnaces and many A/C units without being conservative. For such a large unit, it’s relatively efficient. If you’re running it at half load, you can get just over 11 hours out of it. It meets all relevant EPA guidelines, too. 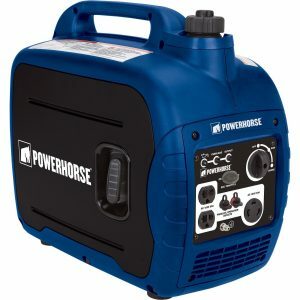 Likewise, it’s a lot smoother than most jumbo portable generators. It has <5% harmonic distortion, with AVR onboard. That’s as smooth as most units half its size and capacity. Overall, we’re impressed by how well the CAT backs up its brawn with brainy features. For instance, a low-idle setting preserves the integrity of the motor and saves fuel when you’re not drawing full power from the unit. The tank is also positioned above the motor to mask sound. There are a whole host of outlets onboard. It has 20A, 30A, and 50A receptacles to suit all your appliances and hookups. Everything’s laid out logically and labelled clearly. There’s an electric start and bright LED controls with graphic labels and even instructional diagrams right on the side of the machine. Between those and the excellent video tutorials provided online, this is one of the easiest generators to use! Like other CAT equipment, this generator is seriously heavy-duty. It has a protective steel roll cage all around, and all the parts feel rugged. While there’s no ignoring the fact that this is a massive unit, it’s not as hard as you’d think to get around. A padded handle folds out from the frame for easy rolling, and it’s relatively easy to wheel about, for something so massive. It’s close to a cubic yard, but a neat and compact package. It’s covered by a 3-year warranty and 24/7 phone support. It even includes a special tool and maintenance kit to help you keep the generator running at peak performance! Square Trade also offers an additional 4-year policy on this one for a remarkably low cost. That’s easy to add on when you follow the links in this review! It’s a real behemoth. At nearly 400 pounds, this isn’t something you can move around casually. It’s manageable for a strong person, but you may want help. And while you can roll it fairly easily, you would not want to have to lift it. There’s a lot of value here, but it’s not exactly cheap. Don’t expect to find one of these for under $3K. We’re sure the tank placement reduces noise somewhat, but that still doesn’t change the fact that this is a big, loud generator. Put it on the opposite end of the house from the bedrooms, if possible! If you want something quieter, spend more for the Honda. Don’t expect as much grunt power, though. 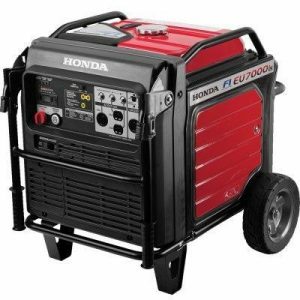 Our ultimate recommendation for the best portable generator comes from Honda, one of the most respected brands on the power tool market. The EU7000I is a rugged machine, with a metal casing and a big fuel-injected motor which gives it some of the best fuel economy and reliability on the market. It’s a beast of a machine, but we love it because it cranks out huge power from a quiet, efficient package. The smart features, fuel savings, and exceptional reliability you get with the Honda make it our top recommendation for anyone looking for the absolute best quality portable unit! It’s all self-contained, like the CAT. Unlike the comparable Champion, the Honda’s housing encloses almost all its parts. That makes it a much better choice for busy worksites, where debris or fast-moving construction components could damage exposed components. It’s a neat little block with metal panels on all sides. If you’re storing it for a home backup, there’s less of a chance pests will get inside and build a home while you’re not using the machine. It’s very efficient. This one can run up to 18 hours on a single 5-gallon tank, depending on the load. Even at full bore, it can last 6 hours on a single tank, which is much better than the Champion, if not longer than the CAT. That’s a full 20% more efficient than its predecessor! Previous buyers were extremely impressed by how efficiently the Honda ran. They said that not only was it better than other 7/5.5KW models, it was actually more efficient than smaller models they owned, as well! Even though it’s efficient, it doesn’t skimp on power. This one cranks out a full 7 KW, which is enough to back up your house in an emergency, or power a busy worksite. Previous buyers used it for RV trips, industrial worksites, and home backup systems. Since it’s portable, you can use the Honda for all those applications, whenever you need it! It provides very stable power. The Honda produces power with less than 2.5% harmonic distortion, which makes it twice as safe as the CAT or Champion for more delicate or technical devices like computers, A/V equipment, or smartphones. It’s fuel-injected. In fact, this is the first fuel-injected model ever produced by Honda. That makes the motor more efficient. It also eliminates fiddling around with the choke, and makes carburetor worries much less frequent. Overall, it’s a much smarter motor design than the CAT or Champion, and the smart injection system is what’s responsible for most of the price difference. It’s quiet. This one operates at between 52 and 60 decibels, which is a solid 10-20 decibels below the competition! That makes it a much less obnoxious choice for home backup, or for outdoor party power. Plus, on a busy worksite where there are a dozen sources of noise, it makes a big difference cutting down on that background racket. This one’s quieter than normal conversations. It has a smart console system built in. The iMonitor display tracks and displays runtime, RPM, volts and wattage. You’ll find warning lights for maintenance like changing the oil, and for battery charge. It also operates like the computer in your car, so that a technician can get an instant readout on the engine’s health. It has the most sophisticated computer of our three recommendations, which helps make this one of the safest and most reliable options out there. It also has the potential to be expanded with a remote control system. It’s a versatile power station. You can choose between two power output settings. In the first mode, both 240V and 120V are available through all of the outlets. In the second, only 120V is output. That limits you to standard household power, but it also allows larger appliances and loads to get the full output of the machine. That’s ideal for things like a fridge or freezer, which would have higher operating wattages. It has two 30 amp worksite outlets built in, and two 20 amp standard outlets onboard as well. Even though it’s very heavy-duty, it’s still very much a portable model. It has folding handles built in, which are adjustable to fit either a wheelbarrow or upright arrangement, depending on what you prefer. There are also wheels built into the base. It has a two-wheel design which makes it very stable for uneven surfaces. It starts with a push-button system, and there’s a recoil cable for backup. Previous buyers said it’s extremely reliable, even when starting in cold weather or after a long break! It has lots of smart alerts and safeguards built in. There are lights to indicate when power is being produced, when oil is low, and when the battery is charged. There’s also a circuit breaker, to make sure the system is never overloaded. The motor will shut off if oil gets too low, to prevent any internal damage. It’s covered by a 3-year warranty, which is good for both commercial and residential use. You can operate this machine in parallel with another EU7000iS, in order to produce up to 14KW of electricity. It’s one of the best-rated models on the market. It’s recommended by Consumer Reports, it has outstanding reviews from homeowners, and it’s highly regarded by professional construction and industrial workers as well. Buyers and reviewers overwhelmingly concurred that while this was one of the priciest models they’d ever used, they could instantly tell why it was worth the money. They said that every aspect of the design and construction felt well-thought-out and solidly built, and that it was an infinitely more reliable machine than others. It’s not nearly as powerful as the CAT, despite costing more. This one has a peak output of 7KW, as opposed to 7.5KW for the Champion and 12KW for the CAT. If you’re a spec and detail person, it might seem counterintuitive to spend more money for a lower wattage. However, we think the Honda more than makes up for its lower output in smart design features and reliability. Even though it’s quiet and efficient, it’s not exactly light. This one weighs 260 pounds, so you need to have some strength to cart it around. The Champion is the obvious choice to people on a tight budget. It’s the only one of our recommendations you can find priced under $1,000, and we think it’s the best budget option that’s up to powering a home or worksite. It produces just as much power as our more expensive choices, and it’s versatile enough to handle a range of applications. It’s also the only machine here that works on propane as well as gas. However, Champion machines aren’t as efficient or as reliable overall as CAT or Honda. This one also lacks some of the safeguards and power stability of the two more expensive recommendations. The CAT is the obvious choice for someone looking to get the most bang for their buck. It has by far the highest output of the three, as well as the most outlets and largest tank. We don’t think you can find a more brawny portable model–especially not as reliable as the CAT. If you have high energy demands or simply want to ride out outages without noticing a thing, get this one. The CAT is pretty expensive, though. It’s also extremely heavy and quite loud. The Honda is more refined, but it costs more and cranks out less power. 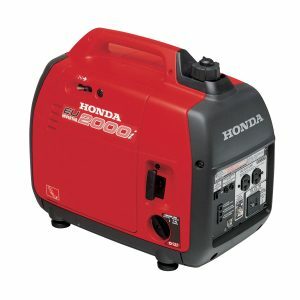 If you’re looking for the absolute best portable generator out there right now, we strongly recommend the Honda. It’s the designed the smartest of the three machines, with a smart monitoring system and safety shutoffs. It’s quieter than the CAT or Champion, and uses far less fuel. Best of all, it comes with a very impressive 3-year warranty that covers commercial as well as residential use. By contrast, the Kohler and Champion have warranty coverage, but it wouldn’t include commercial use. Whether you’re a contractor looking for a rugged workhorse, or a homeowner looking for the best peace of mind and convenience, this is by far the best portable model we’ve reviewed. However, the Honda is also 5 times the price of the Champion, and it doesn’t produce any more power. But we think it’s by far the smartest, safest, and most dependable machine here. With that said, we realize that the price tag might put it out of range for some shoppers. Here at Best Generator Reviews, we put a premium on reliability. After all, it doesn’t matter how many great features a machine has if it won’t start when you really need it. That’s why we’ve gone out of our way to recommend machines that have excellent reputations for starting every time, and working reliably each time you use them. With that said, we know that our recommendations are fairly expensive. 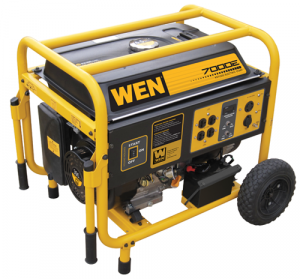 WEN is one of the most popular generator brands out there these days. They have a Chinese-made lineup of machines with a variety of designs which are pretty similar to the big name brands. 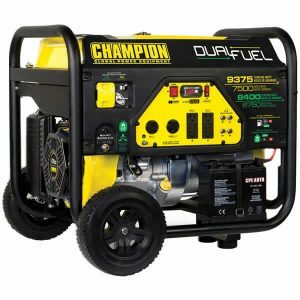 They’re popular for their affordable price, and their close approximations of some of the premium features you’ll usually see on the big brand versions of their generators. This series is built around a tubular steel frame, and it’s available in a whole range of wattages. You can find models from 1800 to 13000W, all priced much lower than other brands. For such inexpensive units, they have a lot of features which you wouldn’t normally expect in this price range. They have automatic shutoff in case of low oil levels, a keyless electric start, and a wide range of outlets to choose from. If you need to maximize your wattage to dollar ratio, and can’t afford any of our Top Three, you might consider one of these WEN models. With so many wattage options, it’s pretty easy to find one to suit your exact needs. Previous buyers said that while they’re loud and a bit clunky, they put out a lot of power and are surprisingly dependable for the price. Before you buy, though, we recommend these WEN models with a few caveats. First, they’re not very clean or efficient. These machines burn some serious fuel. They’re inefficient, and they don’t meet California’s CARB standards for emissions controls. If you’re environmentally-conscious, or simply thrifty, the high fuel consumption might give you pause. Second, they’re not the most reliable machines on the market. The majority of buyers don’t report any issues, and most issues that buyers did run into weren’t serious. However, these machines don’t have a great track record for reliability or durability. They have shorter warranties and a worse reputation for service than the big brands like Honda or Yamaha. Third, they’re not nearly as stable in terms of output as the more expensive options. We wouldn’t plug anything delicate or technical into a WEN machine. So, with all that out of the way, we recommend these models to people on a very tight budget, who aren’t going to expect their generator to have premium functions, great fuel economy or last forever. If you have an aptitude for DIY mechanics, you might actually find a WEN to be a good project. With some customization and modifications, many people found them to be great workhorses for a very low price. And of course, some buyers will always be drawn to these for the price. However, for the average consumer who could find a bit of extra cash to buy something nicer, we don’t recommend these. They’re a bit too iffy in an emergency for our liking, and the competition is just plain nicer. All of the portable generators in our Top Three are big enough to handle backing up your home or powering a worksite. We decided to focus on larger generators because that’s what most shoppers are looking for. However, if you’re looking for a small-scale portable generator, don’t think for a second we’ve forgotten you! The EU2000I is from the same series as EU7000IS we chose as our top quality pick for a full-size portable generator. It’s an ultra-quiet little generator which easily gets our nod for smaller applications. At less than 2 feet across, it’s incredibly compact. And at less than 50 pounds, pretty much anyone can carry it. At the same time, it puts out some serious juice. It can power camper AC systems, a tailgate party, or maintain a fridge/freezer in an outage. Previous buyers used this model for all sorts of applications, from camping trips to outdoor parties to home backup during outages. We even found that many reviewers used it for a backup power source for solar installations in off-the-grid cabins and houses. It’s very versatile, and you can even string two of these together to produce up to 4KW of power at once. We know this one isn’t the cheapest 2000W unit on the market, but it’s by far the best in our estimations. It has all the great safety features we love on the big EU7000IS, including an oil level safety shut-off and circuit breakers, which cheaper options don’t have. The Honda also lives up to the “ultra quiet” name, with a standard running spec of under 60 decibels. On the Eco mode, it’s barely audible! It’s more efficient, too. This one can run up to 8 hours on a single tank. It also puts out very clean, stable power which keeps things like TVs and HAM radios safe from electronic damage. Plus, it has a legendary reputation for reliability. If you can invest a bit more up front, reviewers said these run for years and years with no issues! We think it’s safe to say this is the best small portable generator on the market by far! Portable generators are available from around $200 to upwards of $5,000. Your budget will depend on how much power you need, how portable you need that power to be, and how much you care about amenities like low-noise housing and power stability features. As you’d expect, you’ll pay more for a more powerful generator, with a higher total wattage. You’ll also pay more for smart features, like automatic oil shutoff, which protects the engine over longer use, and superior harmonic regulation, which keeps the power you produce safe for your more sensitive appliances. Expect more expensive generators to have better fuel efficiency, which means savings on gas, and a longer running time per tank. With that in mind, a more expensive unit up front can turn out to be a smart financial decision in the long term. We recommend spending at least $500 on any generator, as a general rule. We’ve found that generators under $500 have poor reliability, especially when you’re trying to start them. They’re loud, inefficient, and you can’t count on them in a tight spot, like a power outage or emergency situation. It’s worth spending a bit more money for something you can rely on. If you’re planning to use your portable generator as a backup for your house, you’ll want to budget for at least $1,000. The minimum wattage we recommend for home backup is 7KW, and you won’t find many 7KW generators under $1K in the first place. The ones you will find at that power class for under $1000 are shoddily built and fairly unreliable. You also wouldn’t want to plug anything sensitive like electronics or tech gear into those generators, since they produce such variable power. We recommend spending $1,000 at minimum for the peace of mind that your generator will actually work when you need it to, and keep your gear safe in the process. Plan to spend $1000 as an absolute minimum for home backup. We generally advise buyers to spend as much as they are able to for a portable generator, at slightly above the wattage scale that they require. Within the appropriate wattage class, try to spend as much as you are able to. More expensive generators are more efficient, which gives you better fuel economy per tank. That means longer running time (more convenient in an outage) and a lower running cost (fewer fill-ups). They’re also more reliable, especially in colder conditions like a winter snowstorm, when you really need them to start quickly. If you use your generator frequently, or live in a place where outages are more likely, you’ll start to see that high initial price tag pay for itself in a hurry! Before you start considering different generator options, you should get a firm handle on what your actual power needs are from your new unit. Think about what specific applications you want to use your generator for, and how much power each application (or “load”) uses. Figure out the wattage you need, whether it’s as a home backup or an RV power system. Then, round up slightly. That’ll help you out in case it happens to be a particularly hot day, for instance, and your A/C needs to run harder than average. A higher wattage than you need is also a good idea because many generators are advertised at their absolute maximum output. Their average running output may be slightly lower, to the tune of 500W. It’s always a good idea to err on the side of caution, and get a more capable generator than you need. You’ll measure the amount of your total load in terms of wattage. The wattage of a generator (e.g. 7500W, or 7.5KW) tells you the amount of power it’ll put out. Likewise, the wattage on an appliance tells you how much power it will demand from your generator. Add up each appliance or piece of equipment, like a fridge or a sump pump. Then, round up to come up with a minimum for what you want. Your needs could vary from 2000W to 7000W+, depending on whether you’re looking for a camping generator, a home backup, or both. We recommend a minimum wattage of 2000W (2KW) for any portable generator. That’s a good amount for a campsite, or for keeping basic essentials running in a home outage. If you’re looking for something that will back up your home, with fridge and freezer running, in an outage, you’ll need at least 7000W (7KW). You’ll also want to bear in mind the voltage your appliances run on. Generally, they’ll either be 120 or 240 V, if they use typical outlets. Auto appliances, and many RV appliances run on 12V cigarette lighter sockets. The voltage on a generator isn’t always constant. It’s dictated by the specific outlets onboard. Most generators have several 120V (standard household) outlets, and either a 12V DC outlet for car/RV-style appliances or a 30A power tool locking socket. You won’t choose a generator based on the voltage, but you’ll want to make sure your generator has the right outlets (and enough of them) for everything you want to run. Finally, when you’re considering your power needs, you’ll need to think about the actual quality of the power that you need. Power quality is measured in terms of how steady it is. The more variable the power, the more likely it is to zap delicate electronics. You’ll want to look for power quality rated in terms of THD (total harmonic distortion). Make sure any unit you buy is rated below 5%, and the closer it is to 1%, the better. For big, industrial things like a sump pump, freezer, or A/C unit, you can get away with something a bit more variable. Still, you won’t ever want to get a generator that produces more than 5% THD. Anything technological, like phones or laptops, shouldn’t be plugged into a system that produces more than 2.5% THD, for safety. Power quality is yet another reason not to skimp when you’re buying a generator. The more you pay, the less THD you’ll see in the output of your machine. Last but certainly not least, you should make sure you think about just how portable your new portable generator will be. Think about how you’re planning on using it, and make sure it’s sized appropriately for your application and your transport options. If you’re going to be carrying your generator yourself, it’s a good idea to look for something around 50 pounds, and not more than 70 pounds. If you need to lift your generator, you should either stick with something on the lighter side, or make sure you have help. For larger units, we recommend making sure your power station has a wheeled base. You can use a ramp to get it into your vehicle much more easily than lifting. Wheels also make larger home backup units easier to get from the garage to wherever you’ll run them outside. If you’re going to be bringing a generator camping, you’ll want to measure your camper, and make sure you’ve got a spot for it to sit while you travel to your site. When you consider portability, take note of the physical measurements and weight of your generator, and bear in mind that you’ll need to add in fuel to the equation. Solar generators are a hot topic all around the market, whether they’re used as a green home backup solution or as a way to lower your energy bills and get off the grid. They’re an incredibly exciting new technology, since they provide electricity from free and unlimited solar energy. With a solar generator, you can provide as much power for yourself as you need, and store it in a battery for whenever there’s an outage or emergency. You can also take a solar generator on a camping trip for a silent, constant source of power for all your amenities. There’s a lot to get excited about, so we put together a whole guide specially devoted to solar generators. We’ll look at several top options which make our current Top Three in the solar category. We’ve also put together a straightforward How-To section which explains how a solar generator works, and how to know your way around the key components as you shop. This unit is one of the most portable, convenient generators we’ve seen on the market–solar or not! It’s built around a suitcase frame, with a fold-open design that includes two solar panels, a charge controller, and built-in battery. 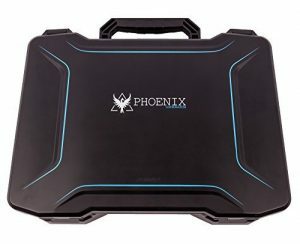 The Phoenix can be carried and set up pretty much anywhere, as long as there’s sun. Unlike gas generators, it doesn’t always need fuel to provide electricity. You can open it on the occasional sunny day, leave it on the kitchen table for a few hours, and keep it topped up for when you need it! It may be compact, but it has more than enough power to run tech and communications equipment, top up backup batteries, and keep CPAP machines running in a pinch. We think it’s a great choice for camping trips, or for keeping the essentials online during a power outage. Read our full review of the Phoenix, and check out the rest of our favorite solar generators here. Look for a gas-powered generator solution without all the racket? You came to the right place! 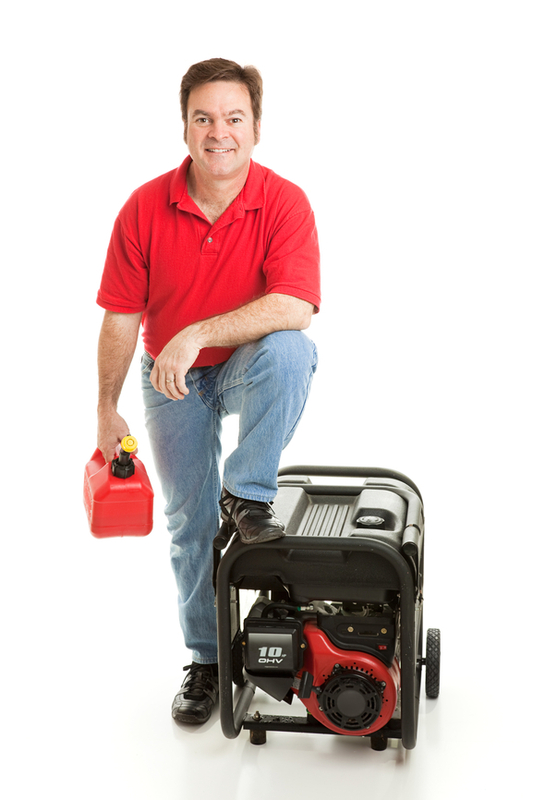 We know that one of the biggest downsides of using traditional gasoline generators is the noise they produce. It can be obnoxious around the campground, and it can put a real damper on your backyard party. This guide brings you three of our favorite quiet portable generators, and all the tips and info you’ll need to shop for your perfect model. We searched specifically for generators which cut down on the noise factor without sacrificing output or reliability. It’s a small-scale portable unit which cranks out 1600W, and starts at 2000W to kick-start your A/C units and other larger appliances with high starting wattages. We love it for camping trips, tailgate parties, and small worksite jobs. This unit also has very stable power output that’s safe for tech devices and sensitive appliances. We’re particularly impressed with the Powerhorse’s value factor, especially given how reliable and durable it is in operation. It’s half the price of a Honda or Yamaha, and it still performs miles better than other budget options. Best of all, it’s quiet. With an operating level of 52 decibels, it’s easy to have on in the background without creating a racket. To see the rest of our recommendations for the best quiet portable generators, check out the full guide! For ultimate peace of mind in an outage, nothing compares to a whole-house stationary generator. While portable options can get you through until the grid comes back on, you’ll have to be home to run them, and you’ll have to refill the gas tank regularly. Plus, no portable generator will allow you to live comfortably through an outage as if nothing had happened. Home generators turn on regardless of whether you’re home when an outage occurs. That means you sump pumps always turn on to prevent flooding, and your pipes won’t freeze, since you don’t need to be awake or even home to keep the furnace and water going. They provide plenty of power to run the essentials, and they have enough left over to allow you to watch TV, make dinner, and carry on with your lives while the power’s out! While whole-house generators can be one of the most satisfying purchases you make as a homeowner, they can also be one of the most daunting, thanks to the big price tags on these units. Well, you’re in safe hands. 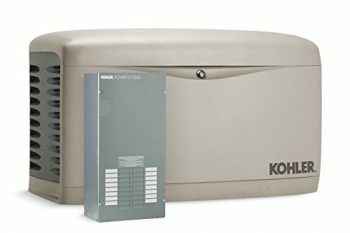 In our comprehensive guide to the best home generators, we talk you through figuring out how much power you’ll need from your unit, how much to spend, and which units are currently the best buys on the market! 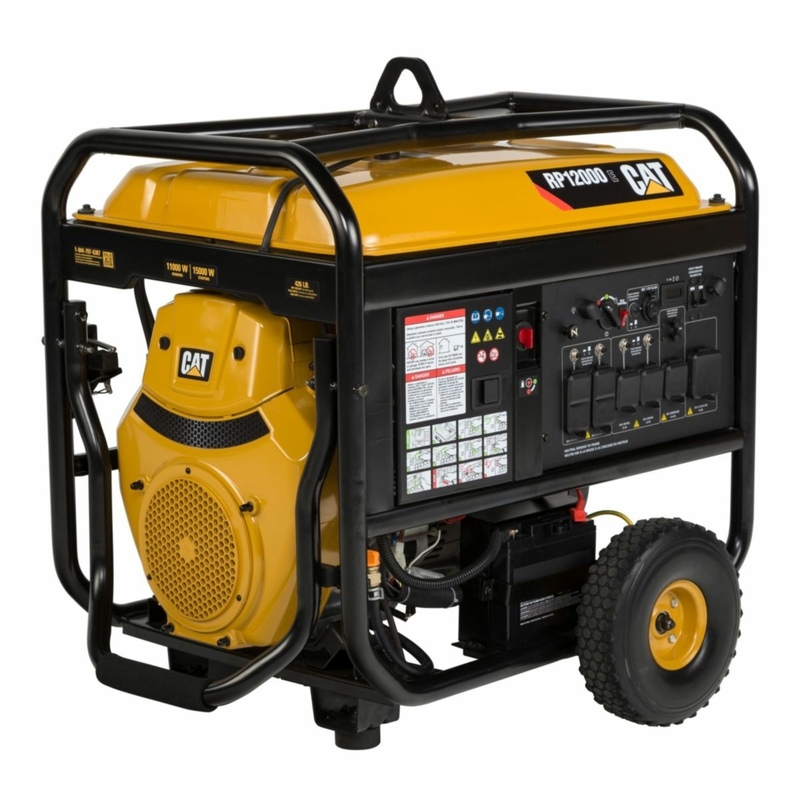 This is one of the most highly-rated generators on the whole market. It’s recommended by Consumer Reports, and it’s been featured in lots of other periodicals for its efficiency and reliability. We think it’s an excellent midrange choice for smaller homes and average-size homes that don’t use a lot of electricity. The Kohler has lots of smart features and rugged construction elements which make it a great balance between strength and intelligent design. It’s completely weatherproofed, with a corrosion-proof exterior and drip-proof design. It’s responsive, with a 10-second startup time, and an electronic regulator which helps it respond adeptly to changes in load. It also produces very clean power, with less than 1% total harmonic distortion! That means you never have to worry about running your A/V equipment or tech gear off the generator. And, at just over 2 gallons per hour at full load, it’s one of the most efficient workers on the market. See our full review here, and check out the rest of our recommendations for whole-house generators! Still looking for your perfect portable generator? Check out Amazon’s best selling generators!